Title text: Our retina display features hundreds of pixels per inch in the central fovea region. This is the seventh entry in the ongoing xkcd Phone series, and once again, the comic plays with many standard tech buzzwords, and horribly misuses all of them, to create a phone that sounds impressive but self-evidently isn't to even the most ignorant customer. 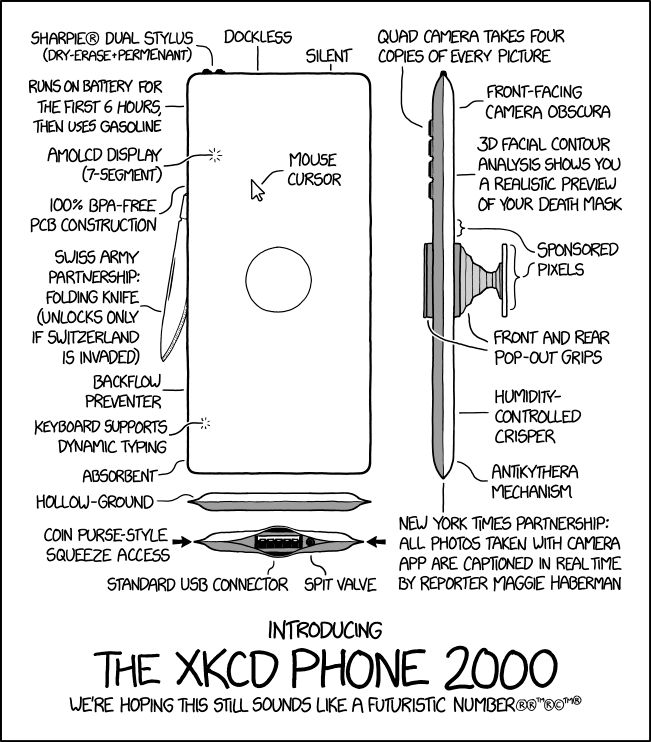 The previous comic in the series 1889: xkcd Phone 6 was released 8 and a half months before this one, which is so far the last on the series. This time a nonconsecutive version number is used to match the milestone comic number 2000. Dockless: It was common practice for older standard cellphones (i.e. non-smartphones) to use a docking station for charging. "Dockless" could be a catchy marketing term for wireless charging, or it could simply mean wired charging without a dock. Silent: Most mobile phones have a "Silent" mode in which all ringing and vibration is muted, so the user can receive messages and missed-call notifications in a place that requires silence. This xkcd Phone feature may be a "Silent" mode button, but perhaps the phone is silent all the time and unable to produce sound at all. While most people these days use their smartphones for functions that do not require sound, a completely silent phone would not fit the traditional definition of a "phone". This feature is labelled at the location where a headphone socket would traditionally be, although some recent phones have discarded the traditional headphone jack in place of wireless headphones. Quad camera takes four copies of every picture: Recent phones have added up to three rear-facing cameras, offering different fields of view, monochrome cameras for low light, and a wider base for emulating depth of field effects. At the time of writing no phone on the market has four rear-facing cameras. However, YouTube personality nigahiga created a parody of the iPhone (iFhone 8) that has four cameras structured similarly, e.g. taking a picture of a letter K gives 4K. An alternative interpretation is that the cameras take four identical pictures simultaneously, which would use up storage space at 4 times the rate of a standard camera while providing no advantage. Front-facing camera obscura: A camera obscura is a dark room or box with a small hole allowing light to enter. The size of the hole causes light travelling in straight lines to project a dim inverted image on the back of the room or box; the concept is the predecessor to a modern camera, which uses a lens to allow more light to enter. A camera obscura is not strictly speaking a camera as in an image capture device (although there are pin-hole cameras which use the same mechanism). Actual phones have front-facing conventional cameras, allowing selfies, video calling, etc. 3D facial contour analysis shows you a realistic preview of your death mask: Recent computational photography effects implemented on mobile phones support facial analysis, allowing for artificial relighting or the creation of avatars. However, since a death mask is created to look just like the deceased's face, all cameras provide this "feature" automatically. Sponsored pixels: Presumably this means that parts of the screen (pixels) can be bought in a sponsoring deal. If enough pixels are sold, your screen would be rendered unusable. It is common for advertisers to buy part of the screen real-estate on a service web site (in fact, The Million Dollar Homepage hosted nothing but a 1000x1000 pixel grid of advertisements), and "images" the size of individual pixels can be used to track site access without being intrusive to the user. For the xkcd Phone 2000, it appears that advertisers have access to part of the screen (worryingly, right in the middle). Slightly less intrusive approaches have been used in bookstores selling customised versions of the Kindle, for example, and it is common for cell phone networks to insist on network-specific software to be installed on a phone. Front and rear pop-out grips: There are accessories that stick to the rear of a phone and can be "popped out", offering a grip, a stand, or somewhere to store headphone cables. Integrating such a feature into the phone design is novel, although some phones have incorporated kick stands. Pop-out grips are normally placed on the back of the phone to make it easier to hold with one hand. Having a second grip to the front of the phone does nothing except block part of the screen. There could be a small screen on the top of the grip since the grip is shown to contain "Sponsored Pixels". Humidity-controlled crisper: A crisper is a drawer in a refrigerator meant to control the humidity to keep vegetables from drying out and getting limp. Obviously, a smartphone would have no need for a crisper. Antikythera mechanism: The antikythera mechanism is an ancient Greek clockwork device for predicting astronomical positions. It is one of the earliest known analogue computers. While impressive for its time, by now it is obsolete by millennia. New York Times partnership: all photos taken with camera app are captioned in real time by reporter Maggie Haberman: Modern phones can use machine learning techniques (usually in the cloud) to identify and tag camera content - this makes it possible to search, for example, for photos containing a particular person or subject without requiring user input. Cellphone photos are often used in contributions to social media with some form of user-provided caption. This phone appears to combine the two, using Maggie Haberman to provide automatic captions for photos taken by the phone's owner (although whether this is explicitly for social media use or internal to the phone is unclear). Spit valve: A water key, or "spit valve," is a feature on most brass and some woodwind instruments used to empty the instrument of condensation caused by the musician's breath (and not, as is commonly thought, saliva). Of course, one wouldn't think condensation would form on the inside of a smartphone. Coin purse-style squeeze access: presumably, the casing is flexible in this region, and when squeezed at the sides (a bad idea, considering the next design item) reveals the USB A port and spit valve. Hollow-ground: a hollow grind is a type of knife (or similar sharp tool) edge noted for sharpness and general fragility, often seen in razors. This seems to imply that the phone is exceedingly smooth, which would make it difficult to hold. Absorbent: Many modern phones are designed to be waterproof, to avoid accidents and allow use in the rain. It's also common to have some form of oleophobic coating on the screen to reduce smearing as fingers are used on the touchscreen. This phone seems to have the reverse feature, and be explicitly designed to absorb things (presumably liquids--perhaps that's why it needs a spit valve). "Absorbent" is more commonly a property touted by the packaging of paper towels. Keyboard supports dynamic typing: Dynamic typing is a computer programming concept, and has nothing to do with typing on a keyboard. Backflow preventer: A backflow prevention device is a mechanism that avoids the possibility of liquid (usually water) travelling in the opposite direction from the normal intent if the expected pressure is inverted. Since there is not normally any liquid flowing through a phone (unless in this case relating to the spit valve), this would not normally be a useful feature. However, some smart phones do contain pressure measuring devices such as barometers (which can also be used in some cases to detect the phone being squeezed), so maybe this phone is intended to be resilient to such conditions. Swiss Army partnership: folding knife (unlocks only if Switzerland is invaded): A Swiss Army knife is a folding knife, traditionally with many secondary "blades" for multiple uses such as can openers and files. Usually it is a generic term for that style of knife, but the knife in this phone surprisingly really has a connection with the army of Switzerland. Switzerland is known for remaining neutral (and not being invaded) in both of the World Wars of the 20th century despite war raging across surrounding countries, suggesting that it is unlikely that the knife would ever be unlocked. While such a feature on a phone (or phone case) may be useful, it is likely to be a safety concern, and a threat to convenience when security checkpoints such as airports start confiscating the phone when they notice it conceals a knife blade. What's more, a phone does not provide the ideal grip for a knife blade - especially if force is to be applied to it. This may also reference the Swiss military practice of soldiers keeping military rifles in their private homes but only being given ammunition in the event the army is mobilized. 100% BPA-free PCB construction: Bisphenol A (BPA) is a chemical used in plastics such as waterbottles. Recent studies show that BPA can leach estrogen-like compounds into liquids, so BPA-free water bottles have become popular. PCB probably refers to a printed circuit board, which is made of resin-bonded fiberglass, not plastic, and which contains the electrical components that control most modern electronic devices such as phones. It may also refer to Polychlorinated biphenyl (PCBs), a category of persistent organic pollutants which are not used very much any more; it would be far worse than BPA for anyone concerned with the issue. AMOLCD display (7-segment): AMOLED is a display technology often used in cell phones, providing thin and emissive displays. LCD is another display technology used in phones, and works by blocking light from a separate backlight. A 7-segment display is a device made of seven independently-controlled segments (usually either LCD or LED) which can be used to display a single digit; as such the technology is common in traditional digital watches. In contrast most phone displays are made of a uniform high-resolution pixel grid that allows arbitrary content to be displayed, although some very old (pre-smart) cellphones and land lines did use this technology in displaying a phone number, like the MotoFONE F3. The technology cannot represent the entire alphabet without modification, so it is inappropriate for text messages, let alone graphics. Runs on battery for the first 6 hours, then uses gasoline: A nod to the increased popularity of gas-electric hybrid vehicles. This would be a fantastic breakthrough for fuel cells. There have been many attempts to create a highly portable fuel cell that can be used to power phones. Although having to use gasoline instead of a USB cord would likely cause more problems for the average consumer a fuel cell does have some notable advantages over a standard lithium-ion battery. When comparing a fuel cell to a battery of equal size the fuel cell will be capable of powering an object for far longer than the battery. This includes lithium-ion batteries which are commonly used for powering phones and are typically the majority of its mass. This would mean one could shrink the size of the battery substantially yet still be able to provide the same amount of power. The smaller battery can be kept as is in order to reduce the weight of the phone or can free up space for more features to be installed into the phone. This might simply be the first xkcd phone that mentions that it does this. Provides a possible explanation to how the manufacturer of the phone is capable of fitting so many unusual features into the phone to begin with. Another advantage of a fuel cell powered phone is that it is independent from a working power grid (useful for disaster situations where thousands of people would no longer be capable of staying in contact with others or people who are stranded and alone) and there is no need for a bulky generator to convert the gasoline into electricity first. This is not the first time Randall has talked about this before, with much of the information here coming from what-if #128: Zippo Phone. Mouse cursor: A feature of BlackBerry smartphones which has gone out of favor due to the popularity of touch screens. However, Android devices, at least, still support Bluetooth HID access, and on some devices it is possible to pair the device with a mouse (and keyboard) and access the screen through a mouse pointer. These peripherals may also be attached with USB On-The-Go. This can be particularly useful if the device is exporting its display to a large external screen - and some manufacturers have provided tethering systems based around pairing a phone with a mouse. The tagline for the phone says that the marketing team hopes that 2000 still sounds like a futuristic number. It was common for a time to have futuristic science-fiction take place on or around the year 2000 (e.g. 2001: A Space Odyssey, Knight Rider 2000, Death Race 2000, Space: 1999), and many devices marketed in the late 20th century had a "2000" as part of their product name in order to sound futuristic. However, since the year 2000 was 18 years ago at the time of this comic's publication, this is no longer the case. The number 2000 also represents the fact that this is the 2000th xkcd comic. The nonsensical trademarking of xkcd Phone slogans has become even more pronounced: as well as the inapplicable-as-ever copyright symbol, the slogan is listed three times as a registered trademark and twice as an unregistered one – and the second of those trademark signs is itself trademarked. The title text refers to Retina Display, a term used to describe Apple products with higher pixel densities. The xkcd Phone marketing team would be unable to use the term due to Apple's having registered it as a trademark. Additionally, the central fovea region is a portion of your eye's retina containing the most densely packed photosensitive neurons (confusing the biological retina with the electronics display of the same name). Foveated rendering is a genuine computer graphics technique intended to increase performance by rendering with higher quality to the regions of the display where the user is looking, and lower quality at the edges of vision; it is expected to be useful for virtual reality (one of the uses for cell phones) as a way to deal with the required high pixel densities while managing power consumption. There are displays with variable density, in specialist uses, but such a feature is not practical in a phone because the whole area of the display is typically useful and needs to provide high resolution (as the user's eye moves across it). Title text - Our retina display features hundreds of pixels per inch in the central fovea region. Our isn't them, it's us! We all (mostly) have two eyes and the retina collects visual information in pixels. But hundreds of pixels is far too low. The Wiki article Fovea centralis tells me "50 per 100 micrometres in the most central fovea". This is approximately 12,700 per inch. This would lead to roughly 162 GigaPixels. "Our" means this is a promotional page created by the company that made the phone, so it's "our phone" as in "the phone this company made and is now promoting". It's normal English use, there's no comment to be made. Hundreds of pixels being far too low is one of the jokes in the comic, that they're bragging about a number that is not only unimpressive, but would be embarrassing. This page was last edited on 28 November 2018, at 13:11.